Guidance is compiled and interpreted by professional pilots and physicians at FlightPhysical.com from the 2014 AME Guide pages 167-169, FAA and FDA web data (www.FAA.gov & www.FDA.gov), instructions specified in the Aeronautical Information Manual, Federal Air Surgeon Bulletins from 1999-2015, and 14 CFR Part 61 and Part 67 (the FARs). Near vision of 20/40 or better, Snellen equivalent, at 16 inches in each eye separately, with or without corrective lenses. If age 50 or older, near vision of 20/40 or better, Snellen equivalent, at both 16 inches and 32 inches in each eye separately, with or without corrective lenses. Near vision of 20/40 or better, Snellen equivalent, at 16 inches in each eye separately, with or without corrective lenses. 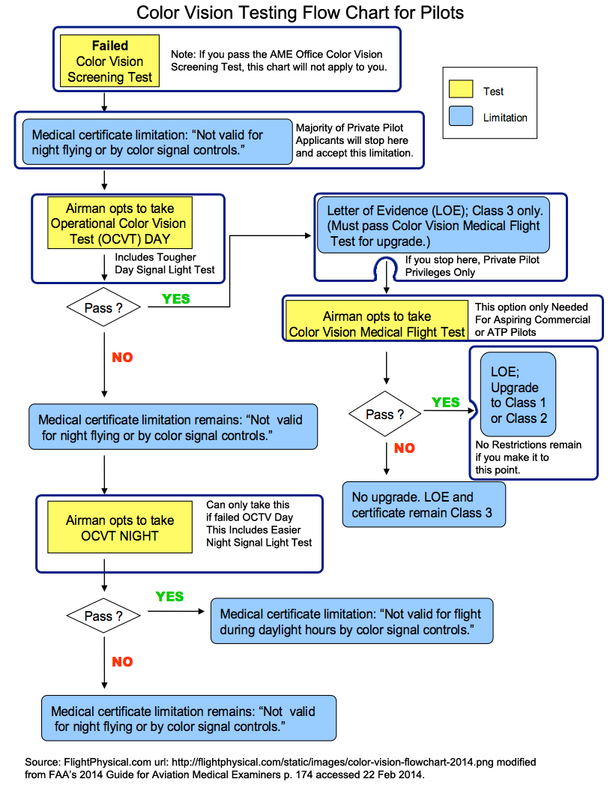 FAA Form 8500-1, Near Vision Acuity Test Chart, dated April 1993. For testing near at 16 inches and intermediate at 32 inches, acceptable substitutes: any commercially available visual acuities and heterophoria testing devices. For testing of intermediate vision, some equipment may require additional apparatus. There are specific approved substitute testers for color vision, which may not include some commercially available vision testing machines. For an approved list, see Item, 52. Color Vision. Near visual acuity and intermediate visual acuity, if the latter is required, are determined for each eye separately and for both eyes together. Test values are recorded both with and without corrective glasses/lenses when either are worn or required to meet the standards. If the applicant is unable to meet the intermediate acuity standard unaided, then he/she is tested using each of the corrective lenses or glasses otherwise needed by that person to meet distant and/or near visual acuity standards. If the aided acuity meets the standard using any of the lenses or glasses, the findings are recorded, and the certificate appropriately limited. If an applicant has no lenses that bring intermediate and/or near visual acuity to the required standards, or better, in each eye, no certificate may be issued, and the applicant is referred to an eye specialist for appropriate visual evaluation and correction. The examination is conducted in a well-lighted room with the source of light behind the applicant. The applicant holds the chart 16 inches (near) and 32 inches (intermediate) from the eyes in a position that will provide uniform illumination. To ensure that the chart is held at exactly 16 inches or 32 inches from the eyes, a string of that length may be attached to the chart. Each eye is tested separately, with the other eye covered. Both eyes are then tested together. The smallest type correctly read with each eye separately and both eyes together is recorded in linear value. In performing the test using FAA Form 8500-1, the level of visual acuity will be recorded as the line of smallest type the applicant reads accurately. The applicant should be allowed no more than two misread letters on any line. Inadequate illumination of the test chart. Failure to hold the chart the specified distance from the eye. Failure to ensure that the untested eye is covered. Failure to determine uncorrected and corrected acuity when the applicant wears glasses. Practical Test. At the bottom of FAA Form 8500-1 is a section for Aeronautical Chart Reading. Letter types and charts are reproduced from aeronautical charts in their actual size. This may be used when a borderline condition exists at the certifiable limits of an applicant's vision. If successfully completed, a favorable certification action may be taken. Acceptable substitute equipment may be used. Directions furnished by the manufacturer or distributor should be followed when using the acceptable substitute devices for the above testing. This page discussed the Near Vision portion of the Eyes & Vision section of the Fight Physical Examination required of pilots.